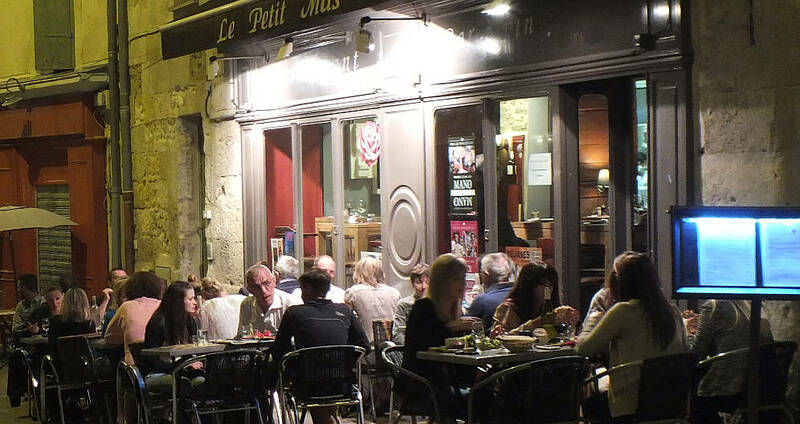 Eating out in France : how much does it cost? 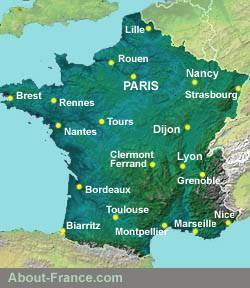 Compared to the UK, French restaurants generally offer excellent value. When eating out, most people opt for a "menu", rather than choosing à la carte (dish by dish), though this is normally possible too. In 2019, average rates for a "Menu du jour" (menu of the day) in traditional restaurants tend to be normally in the range of 14 € to 20 €. That's for a three-course meal. Bread is always included as well. A menu du jour normally offers a limited choice. In chain restaurants such as Flunch, Courtepaille or Buffalo Grill, the cheapest menus may start at under ten Euros for a meal including typically a side plate of salad, a main course such as steak and chips and a desert. A glass of wine or beer or a soft drink may be included too. Average prices depend on local factors, including the competitive environment, and the neighbourhood. Many restaurants now offer an alternative and cheaper two-course option, "Entrée + plat" or "Plat + dessert" (starter and main course, or main course and dessert). In many restaurants, the Menu du jour is only available for lunch: in the evening, it is necessary to choose a more expensive menu or choose à la carte. Most respectable restaurants offer a menu of some sort in the region of 20 €. In gourmet restaurants, menus can be quite a bit more expensive; but gourmet meals are often served at unbeatable prices in quite ordinary restaurants too, and there are plenty of "gastronomic" restaurants even in a city like Lyon, that offer a basic gourmet menu at lunchtime and maybe also for dinner too for between 20€ and 25 €. "Menus" include bread, and restaurants are obliged by law to provide a tap water free of charge (une carafe d'eau du robinet) if requested. They may also include a small carafe of wine. Coffee is normally extra. Check the wine list carefully; restaurants make big mark-ups on the wine, but there are usually house wines avaialble, if you go to the end of the wine list. 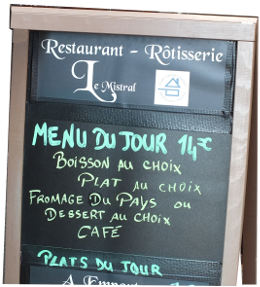 Here is a sample three-course lunchtime menu as offered in a gourmet restaurant in a small French town in July 2018. Each restaurant will, of course, be different. What do people eat in France? When do people eat? What are the best French specialities? These are questions that hundreds of thousands of people ask each year. France is famed as a world leader when it comes to fine eating - known to the French as "gastronomy" and known the world over by the French expression "haute cuisine". The English translation of "haute cuisine", which might be "good cooking", somehow lacks the sophistication and je-ne-sais-quoi of the French expression. * Breakfast - le petit déjeuner [ler peutee day-zheu-nay]. In most cases (at home or in hotels), this will consist of bread, butter and jam, or croissants, perhaps some cereals and / or a glass of orange juice, and a cup of tea or a cup or bowl of coffee or hot chocolate. Older generations often drink their breakfast coffee or chocolate from a bowl, younger generations (and hotels) tend to use cups or mugs. At breakfast, coffee tends to be drunk as a long drink, often with milk, as café au lait, not as the small black expresso coffee that is preferred at other times of the day. * Lunch - le déjeuner. Many places open for lunch as from 11.30 a.m., and continue serving new customers until about 1 p.m. Travellers looking for lunch later than 1.15 p.m. may have to try several restaurants before finding one that will serve them, or else make do with a self-service restaurant, where times are generally more flexible. A typical French lunch will consist of: a starter (une entrée), such as a mixed salad, soup, some terrine or paté. A main course, (le plat principal), typically a choice of meat or fish, with potatoes, rice, pasta and/or vegetables; a cheese course (often a selection of local cheeses) and/or a dessert. Desserts are sometimes not detailed on the menu, so you have to listen to the waiter. Common choices include: fruit tart (such as apple tart, tarte aux pommes), crème caramel, ice-cream (glaces) . Coffee at the end of the meal is an optional extra. Many restaurants offer a special fixed lunchtime menu, with limited choice, called le Menu du jour; some propose just a special day's main course, called "plat du jour" [plar dyu zhoor] in addition to the staple items offered on the menu. These are often worth choosing, as they frequently represent very good value. Almost all restuarants offer a choice between a free choice of things to eat (eating à la carte), and a choice of different menus; depending on the restaurant, the menus may include some very sophisticated dishes. * Dinner le diner. In a French home, dinner - which may or may not be the main meal of the day - is generally eaten between 7.30 p.m and 8.45 p.m. (The main French TV channels schedule their main evening programmes to start at 8.45, after dinner is finished). In town and city restaurants, dinner service often does not start until 8 p.m.; however some restaurants such as self-service restaurants, and restaurants in small towns or the country, start serving earlier. For more details, see the next section. This is a subject that seems to cause enless argument on travel forums.... Should I tip in a restaurant in France, and if so how much? Some travel forums seem to be occupied by cheapskate folk righteously trying to justify not tipping in restaurants in France. As if the fact that waiters in France get social security and medical cover as part of their minimum-wage work contract meant that they didn't need to be tipped! Everyone in Europe gets social security and medical cover as part of their work contract. It's not a perk. The fact is that tipping in restaurants in France IS the norm - but there is no fixed rate. And you can't add it onto the bill as a discretionary - or demanded - extra when paying with a credit card, as you do in North America. A normal tip in France will amount to up to 10% of the bill, left discreetly on the table in coins or small notes. That is in addition to the "service compris" which nowadays is basically a service charge, not to a tip. The ten per cent tip is a normal way of acknowledging good service and/or good food in a restaurant. If service is poor, leave less; but if it is slow because the waiter is worked off his or her feet serving more people than he or she can cope with, don't add insult to injury by not leaving a tip! In self service restaurants, tipping is not expected, though many people will leave a Euro or two on the table or in a basket for this purpose as a "thankyou" to the staff. Finally, in cafés a small tip is always appreciated though not so much of a norm. As stated above,a meal in a typical French restaurant will consist of: a starter (une entrée), such as a mixed salad, soup, some terrine or paté. A main course, (le plat principal, pronounced [ler plar pranseeparle]) typically a choice of meat or fish, with potatoes, rice, pasta and/or vegetables; a cheese course (often a selection of local cheeses) and/or a dessert. Desserts are sometimes not detailed on the menu, so you have to listen to the waiter. Common choices include: fruit tart (such as apple tart, tarte aux pommes), crème caramel, ice-cream (glaces). Coffee at the end of the meal is an optional extra. For special fixed lunchtime menus, called le Menu du jour, see above. It is in the evening, for dinner, that French restaurants often pull out all the stops. Even on weekdays, an eating out in the evening can often be a long-drawn-out affair, and diners can easily spend between two and three hours at the table. Dining out, in France, is an evening's event, not just a means to avoid feeling hungry; it is highly unusual to find restaurants that chivvy their clients to eat up, pay up and leave, as may happen in some other parts of the world. The menu will contain the same stages as the classic three/four-course menu indicated above, but may well include five or six courses, with the addition of an "hors d'oeuvre" [or d'eur-vreu] at the start, and a light green salad or a sorbet between courses. In the best restaurants, diners will be expected to start with a pre-meal drink (an apéritif), which will be accompanied by little home-made snacks, which the French call des amuse-bouche or des amuse-gueule [dayz amuse-girl] - a word that has on occasions been misinterpreted by unsuspecting foreign diners - but really means things to whet your appetite. The number of courses, and the quality of the food, will depend on the reputation and nature of the restaurant, and also on the cost of the menu or à-la-carte dishes chosen; but in any self-respecting restaurant, the cooking will be done using fresh ingredients, and the chefs will take pride in their work. Many French restaurants - and at the top end of the scale, virtually all of them - have adopted "nouvelle cuisine". In this, the accent is very much on quality, taste, originality and presentation, rather than on quantity. While the staple of traditional French cuisine might be something like a plate laden with "steack frites", steak, french fries and french beans (common in restaurants serving workers and truck-drivers), the main dish in a nouvelle cuisine restaurant might be something like fine slices of roast beef, with asparagus in an original cream sauce, with a small portion of pilau rice and two cherry tomatoes - this being carefully arranged on the plate and completed with some form of edible decoration. Those classic dishes that foreigners love to associate with France, snails and frogs legs, belong more to the traditional cuisine than to nouvelle cuisine; but they are not everyday fare in France! 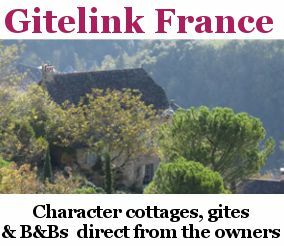 Like many things, they belong to France's deep rural tradition. Both are indeed tasty, though with snails it is really the butter-parsley-and-garlic sauce that is the great taste, and with frogs' legs, the taste is not very different from crunchy chicken wings. Note: most of the frogs legs consumed in France are imported, and the decline in the frog population in certain Asian countries, due to a lucrative export market, has been - and is - an ecological disaster. Due to the good quality and variety of eating experiences offered in traditional restaurants, France has less in the way of international cuisine than some other countries; but with the globalisation of taste and culture, this is changing quite fast. Self-service restaurants in France: Les "self": Self-service restaurants are known in France as cafeterias or as just "selfs". They can be found in motorway service areas, some big stations, city centres, and in most large superstores on the outskirts of town. They provide food of reasonable quality, but for logistical and price reasons use more processed food than independent restaurants do. Cafés, bistrots, brasseries: these are all traditionally drinking establishments, but like pubs in the UK, they have increasingly turned to serving sandwiches and light (and in some cases even substantial) meals, notably at midday. Pizzerias can be found in virtually all French towns, and also along main roads, though they tend to be independent establishments, rather than chains, though there are some chains. The French prefer traditional Italian-style pizzas, on a thin crust, and it is not common to find deep-pan pizzas. Good pizza restaurants operate on the same model as traditional French restaurants, offering three-course meals, where the main course is a pizza. It is very unusual to find pizzerias offering different size pizzas. Chinese restaurants in France. Chinese restaurants are now common in French towns - though often they are actually Vietnamese restaurants. The food is of course oriental, but do not expect to find just the same choice on the menu as in an English or American Chinese restaurant; in France. Chinese restaurants are catering mainly for French customers, and this is reflected in the menu, particularly in the special three-course lunch or dinner menus. Chinese restaurants often offer good value for money, particularly with their set menus at lunch time. Indian restaurants: these are not as common in France as in the UK. As with Chinese restaurants, French Indian restaurants reflect French standards and habits, often paying considerable attention to presentation, and providing an Indian variety of nouvelle cuisine. Algerian Moroccan and Tunisian restaurants. These are quite common, on account of the links betwen France and North Africa. While many are quite basic restaurants, catering for France's north African community, others, more up-market, are sophisticated and offer a fine eating-out experience. Food from other nations: in big towns and cities, many other types of ethnic food restaurants can be found, but elsewhere, apart from pizzerias and the occasional oriental restaurants, the eating is mostly "à la française". Vegetarian food: while being one of Europe's big producers of fruit and vegetables, France is not a good place for vegetarian eating. On account of the generally good quality of food and catering, and the use of fresh products, vegetarianism never really took off in France. French vegetarians become outsiders in great French social events, such as family meals and evenings at the restaurant. Nevertheless, there are now vegetarian restaurants in many French towns (if you can find them), notably in university towns. Meals are still an integral part of family life in France, and the dining table is perhaps the most important piece of furniture in a French home. The French do not generally go in for pre-processed pre-conditioned ready-made food, but prefer to make meals from the raw materials - fresh meat and vegetables, and home made desserts. A traditional "family meal", such as Sunday lunch, or a meal to which guests are invited, can last two to four hours, or even longer in the country. During the week, many people will eat a three-course meal at home every evening; though if all concerned - or most of them - get a full three-course meal at lunch time in the works canteen, in a restaurant, or at the school cantine (and, yes, a proper balanced-diet 3-course meal is standard fare in French school canteens), then the evening meal may often be lighter, a hot snack or pasta or something similar, followed by yoghurt or a dairy desert and fruit. The French eat a lot of fruit and vegetables, and a bowl of green salad may well be provided at every meal. Outdoor barbecues are very popular in suburban and rural France during the warm months. Useful tips. Here are a few points that are useful to know if you are dining out, or inviting French visitors for a meal. The French always eat bread with a meal, and the bread basket is an essential element on any table. If there is a cheese course and a desert, the cheese course always comes first. ; at least three different cheeses will usually be served. Cheese is eaten with bread, not with biscuits. Don't confuse salt and pepper pots. In France, the salt pot has several holes, and the pepper pot just one. Alternatively, there may be coarse sea salt, considered of finer quality than ordinary salt, and pepper from a pepper-mill. Glossary of vocabulary and useful words. Breakfast - le petit déjeuner [ler peutee day-zheu-nay]. Dinner - le diner [ler dee-nay]. France is famed for its gourmet delights, what the French call its "gastronomie"; and though many big cities now vie with Paris for the title of world capital of eating, there can still often be something special about dining out in France. It's not just about great Michelin-starred restaurants, it's about the great dining-out experience to be had in many thousands more restaurants all over France. They're not all good - far from it. But there are still, even today, and in cities, towns and villages across France, plenty that are.